City Tours Europe offers guided tours with professional tour guides all around Europe. For that purpose, we are working with an extended network of tour guides, some of which are permanently employed by our company while others are freelance tour guides. All of these tour guides possess a license that enables them to work as a tour guide in their own country or city. What's more, we regularly control the service quality of the tour guides that work with us, especially as far as performance (entertainment, language) and liability (punctuality, observing of predetermined itineraries and times) are concerned. All these measures guarantee you that if you book your walking tour, museum guided tour or guided sightseeing bus tour with City Tours Europe, you will get a high-quality service matching exactly your expectations. For the customer, the advantages are clear: when you book a guided tour via City Tours Europe, you enjoy valuable benefits in addition to the sheer guide service. To the tour guide you are not just any customer that will never come again. You are a customer of City Tours Europe, and your tour guide will make his / her best to please you because he / she gets contracts from us very regularly - and he / she wants this situation to go on. If some trouble is happening several times with the same tour guide, or if we are getting justified and well-grounded complaints from our customers about a guide, then we will not call on him / her any more - in the interest of our customers. So you do not have to start with sorting the good from the bad, for we are doing it for you - again and again, continuously. City Tours Europe takes care of the marketing for each tour guide's guided tours, and the booking and payment processes. The tour guide thus avoids any risk, which is significant when dealing with customers from all around the world. We can also assist - for free - both beginners and pros with any question concerning legal, fiscal or practical aspect of their job. City Tours Europe set up a special emergency hotline on which the tour guides can call us anytime if any kind of problem should arise. We do not give you any "please call us during office hours", for when it's urgent, it's urgent - and now, not sometime later. No matter if there is a problem with a visit you booked or with a defective bus, an unexpected traffic jam, a road block, a demonstration, or just with the finding of the group or the guide: the team of City Tours Europe remains at the ready night and day so as to be able to assist both the guide and the customer in case of trouble. 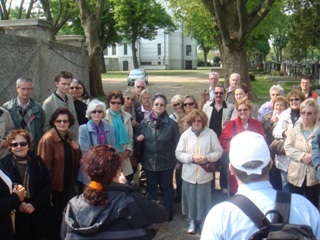 Walking tours: general walking tours and theme guided tours in any European capital city and many other cities in Europe. Bus city tours: sightseeing bus tour in any European capital city and sightseeing tour with bus or minibus in many other cities in Europe. Museum guided tours: visit of the main museums, monasteries, churches, castles and palaces in Europe and visit of many smaller museums, galeries, exhibitions and collections in Europe. Bus excursions: half-day or full-day sightseeing tours in a motor coach or a minivan with a professional bus driver and a licensed tour guide - starting from any capital city in Europe and many smaller towns all around Europe.
. There are good chances that we will be able to provide you with a reliable and suitable licensed tour guide for the visit you are considering. And if we happen not to have any guide for you, then we will at least be able to recommend a reliable guide agency to you!